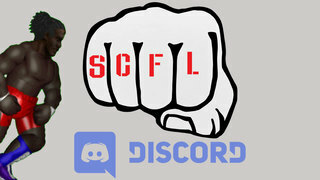 After a few quiet weeks — which by SCFL standards is strange — SCFL Pro returned to form last night with Gyro’s First Strike. The show saw a lot of surprises and strange happenings, to say the least. The main event saw Gyro Supreme challenge the de facto leader of the Shadow Realm, OFFERS (Offers Thompson) for his SCFL Pro Dot TV Championship in what was a very physical 15-minute contest. The bout went to the time limit, but that wasn’t the whole story, not by a long shot. For those curious if Gyro’s “first strike” would be claiming the title that has always meant so much to Offers, they were wrong, because apparently there was a surprise in store for everyone as Freddy Fischer ran down to ringside — sans the Shadow Realm make-up, dyed hair and evil demeanor — and proceeded to attack OFFERS. While Gyro was unable to claim the title, a message was sent to the Shadow Realm: the war has just begun. That wasn’t the only instance of the Shadow Realm that night, not at all, as the Bruisers of Justice Turner and Blowhole Bernard were challenged by October Schmidt and Patty Acosta. No, that duo didn’t join the Shadow Realm, but, instead, a vicious attack happened inside of the Food Place by a returning Weather Walker, who has seemingly found his way back to the arena after months lost in the wilderness. Freddy Fischer was a part of the attack, making his appearance later on all the more shocking. The show closed with Miles Manhoef’s strange return, with the Shadow Realm apparently spitting him back out, where we learned that he would require surgery on his always-questionable knees, which puts his status as SCFL Pro World Championship certificate holder in peril.